Homeless on the streets of Muskegon, Michigan this bitter winter meant that Mr. Wesley Rowell suffered from exposure and lost portions of both feet. It was a series of unfortunate events that led to Rowell’s medical emergency. He had been primary caregiver for his elderly mother prior to her admission to a care facility and death, but he became homeless when the county confiscated his mother’s home due to unpaid taxes. 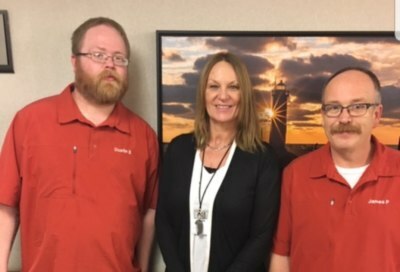 From left are Dustin Baker, Shelly Simmons and Jimmy Pickell, who all helped Mr. Rowell move into his new home in early February. That’s when Shelly Simmons stepped in. Shelly has worked in the nursing home business for 27 years and has been at Muskegon for 12. Among her responsibilities is managing the mobile physicians—specialists who rotate through the facility. This means that Shelly was well acquainted with a physical therapist, Craig Baker with CrossRoads Orthotics, and she needed a favor. Mr. Rowell didn’t qualify for orthotics from Medicaid because he didn’t actually have a specific diagnosis. Shelly appealed to Craig Baker for help, and he agreed to make and donate the orthotics. Once those arrived a few weeks after Craig Baker made a mold of Mr. Rowell’s feet, Dustin Baker, SKLD Muskegon laundry and housekeeping supervisor, set out to get Mr. Rowell some boots to accommodate the orthotics. SKLD Muskegon paid for the boots. “He was taking buses and going around town to look for apartments with just a set of hospital therapy shoes with open toes!” says Shelly. The next feat was to find a new home for Mr. Rowell. He lacked a birth certificate that was required for getting an apartment and was struggling to locate one from Illinois. Shelly managed to track down and purchase his birth certificate TWICE (!) because the first one came back with the wrong county listed. She then spent time taking Mr. Rowell around town to check out available apartments and fill out paperwork. It took a team of helpers, including Jimmy Pickell from laundry and services and, of course, SKLD Muskegon administrator Chelsea Rink, but finally Mr. Rowell secured an apartment and moved in. SKLD covered his security deposit and first month’s rent. Shelly continues to visit him and check on what he needs to maintain his independence.